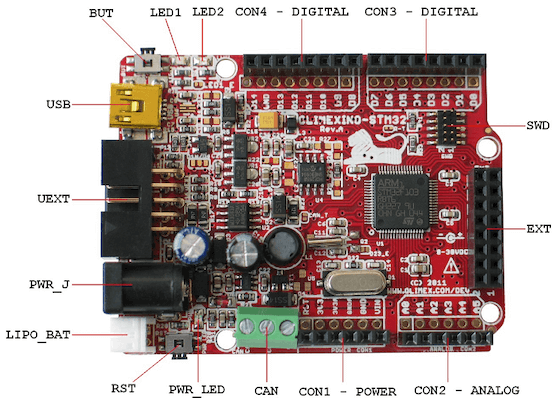 The OLIMEXINO-STM32 board is based on the STMicroelectronics STM32F103RB ARM Cortex-M3 CPU. More information about the board can be found at the OLIMEXINO-STM32 website and OLIMEXINO-STM32 user manual. The ST STM32F103xB Datasheet contains the processor’s information and the datasheet. Other hardware features are not supported by the Zephyr kernel. OLIMEXINO-STM32 has two external oscillators. The frequency of the slow clock is 32.768 kHz. The frequency of the main clock is 8 MHz. The processor can setup HSE to drive the master clock, which can be set as high as 72 MHz. OLIMEXINO-STM32 board has up to 3 U(S)ARTs. The Zephyr console output is assigned to USART1. Default settings are 115200 8N1. 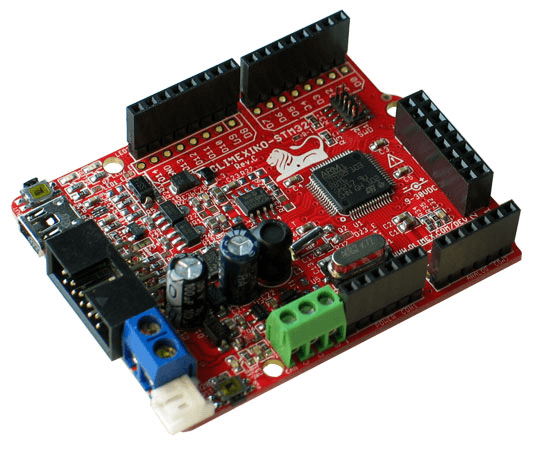 OLIMEXINO-STM32 board has a USB 2.0 full-speed device interface available through its mini USB connector. The Zephyr kernel uses the OLIMEXINO-STM32 default jumper settings. Note that all jumpers on the board are SMD type. You will need to solder, unsolder, or cut them in order to reconfigure them. Flashing the Zephyr kernel onto OLIMEXINO-STM32 requires the stm32flash tool. Checkout the stm32flash tool’s code from the repository. The resulting binary is available at stm32flash. To upload an application to the OLIMEXINO-STM32 board a TTL(3.3V) serial adapter is required. This tutorial uses the Button demo sample application. Connect the serial cable to the UEXT lines of the UART interface (pin #3=TX and pin #4=RX). Power the OLIMEXINO-STM32 via the mini USB. Reset the board while holding the button (BUT). Flash the application using the stm32flash tool. Start by navigating to the build directory containing zephyr.bin. Replace <tty_device> with the port where the board OLIMEXINO-STM32 can be found. For example, under Linux, /dev/ttyUSB0. Run your favorite terminal program to listen for output. The -b option sets baud rate ignoring the value from config. Press the Reset button and you should see the output of button application in your terminal. The state of the BUT button’s GPIO line is monitored and printed to the serial console. When the input button gets pressed, the interrupt handler prints information about this event along with its timestamp. Make sure your terminal program is closed before flashing the binary image, or it will interfere with the flashing process.